Uncooked frozen Pasties are very convenient as they can be stored in the deep freeze for up to 3 months and cooked when required. Pasties should be basted in egg and cooked from frozen for approximately 1hr 10 mins. at 180°C until they are golden brown and piping hot throughout. 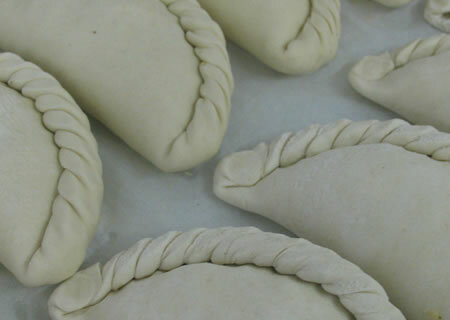 Pastyman™ sends these hand-made frozen pasties straight to your door with 12 midday guaranteed delivery. Please contact us if you have any questions. Beauty... there's nothing like it. Order your frozen Pasties now! All pasties are hand made in Penryn, Cornwall to order. They are packaged in a polystyrene cool box with an ice sheet. Pasties are sent using Business Post - Next Day Guaranteed Before 12 Midday Service. Deliveries before 9am or before 10:30am are available at additional cost, please see the Order Form for further details. Delivery to UK mainland Zone A & Zone B only. Click here to check your delivery postcode. If you need to cater for a party, wedding or other function please contact us. Commercial enquiries please click here. Otherwise, click here to order your Cornish Pasties from Pastyman - Proper job! All photography, graphics & content � Copyright 2005-2007 Kernow Limited unless otherwise stated. All rights reserved.